Apple showed off its upcoming iPhone software update, the so-called iPhone OS 4. It really looks great but to most people, it won’t “look” at all because it’s mostly under the hood, which is how it ought to be. All you’ll know is your iPhone (and iPad) will be easier and more fun to use. There are plenty of things to like about this new version but the thing I’m looking forward to the most is Multi-tasking. Multi-tasking means that with iPhone OS 4 the iPhone can do more than one thing at a time. This lets you receive Skype phone calls on your iPhone even if you’re doing something else. It lets you listen to Pandora radio while you do other things. It lets you use the very cool “Line2” voice-over-IP app even if you switch away from the Line2 app. (It also lets you move between apps very quickly.) This will solve a problem for ME– the one where I’m reading a book and want to adjust the brightness. It used to be hit the Home button, find the Settings, go to the Brightness, then back to the Home screen, then find the book app, then finally tap it. Yikes. Now it’s going to be about three taps. About. Yay. You can watch Steve Jobs and Co. introduce iPhone OS 4 by clicking the link. You’ll see multi-tasking, folders, and a whole lot more. 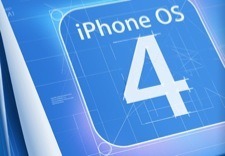 The iPhone OS 4 software will come to us this summer. Watch for it.